Love it back: Yes, weird and provocative, but also recycled! provocative and weird work using recycled materials like this? As it turns out, Dr Frances Geesin does: a softly-spoken, rather unworldly academic of the old school. That said, this is also an artist who has spent a life-time immersed in the realities of the scientific world and a woman who is deeply concerned about upcycling and "creating something precious from the devalued". Her life's work was recognised with a prestigious Arts Foundation Fellowship in Textile Design in 2003. Frances works with conductive fibres and materials ("wearable electronics" as she puts it) and sets out to demystify nano science with the help of medical imaging because this helps make it all visible to her. New medical imaging technologies reveal a depth and layering not possible with standard photography, she says. Frances operates with mainly thermoplastic materials while electroplating is her favoured technique. She sources her basic materials from industry such as braiding in stripped down TV arial cables but she has also used melted 12 bore shot gun cartridges to form flowers for holding pheasant feathers! 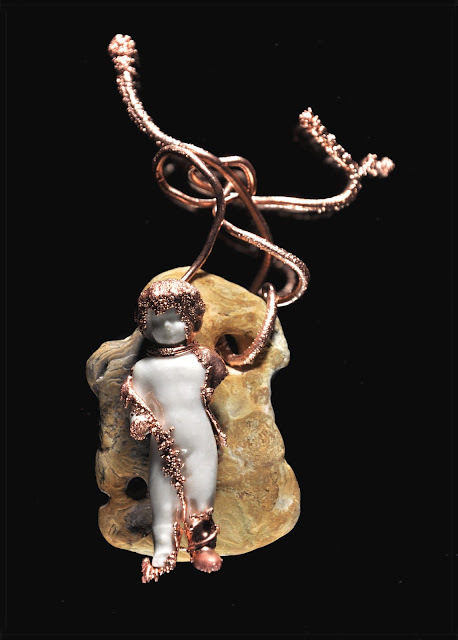 Various works from "Amalgam 2002"
Charlottes" (see more below) with pebbles she upcycled after foraging on Brighton beach and manipulated copper wire before selectively electroplating them. I must admit to finding the "Frozen Charlottes" works disturbing. 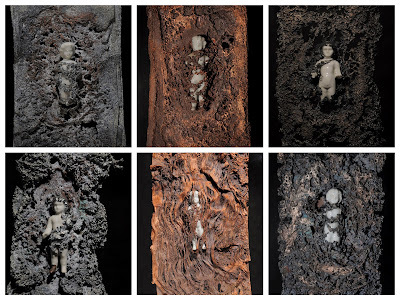 During a symposium in Friedrichshöhe, Germany, in 1994 she found these tiny damaged porcelain dolls in a forest. Vulnerable and fragile to her, they also evoked disturbing images of mass graves. She discovered that local porcelain factory workers had dumped these figures there after their factory was consumed by fire. Frances used them in a series of panels with the dolls enmeshed in conductive fibres which she then metallised. What do you think? Can you Love It Back as such? At the moment, Frances is working on handmade jewellery electroplating sycamore seeds and wishbones and metallising skeletonised leaves which she will be selling at the Mayfield Fringe Festival from May 10-19th.